We understand that these cancellations have been frustrating for customers, and teams from PSA and American have been working around the clock to get things back to normal as quickly as possible. We are rebooking passengers and American’s Customer Relations department continues to reach out to all affected customers. We encourage customers traveling on PSA-operated flights over the next few days to check their flight status at aa.com or on the American Airlines app. Both aa.com and the American Airlines app will let customers verify which carrier operates their flight. 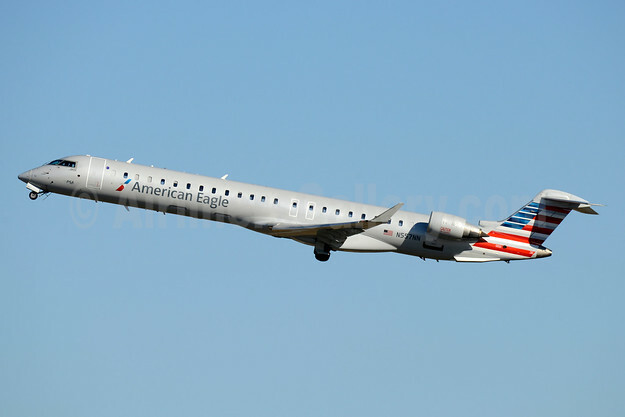 Copyright Photo: American Eagle (2nd)-PSA Airlines (2nd) Bombardier CRJ900 (CL-600-2D24) N557NN (msn 15340) CLT (Jay Selman). Image: 403781. This entry was posted in American Eagle-PSA Airlines (2nd) and tagged American Eagle (2nd)-PSA Airlines (2nd), Bombardier CRJ900 (CL-600-2D24), msn 15340, N557NN on June 19, 2018 by Bruce Drum.